GE is a huge conglomerate, doing business in more than 160 countries in everything from aviation and healthcare to appliances and financial services. While many of the divisions of the company may allow telecommuting for existing employees under flexible work agreements, GE Retail Finance actually hires work-at-home call center agents. In these long-term but part-time (less than 19.5 hours/week) employment positions, work-at-home agents are the main point of contact for consumer applicants for credit in the company’s healthcare and retail financing programs. Additionally agents may also need to field calls from health care providers in the company’s patient financing division. Agents review, analyze and communicate information about credit applications, credit bureau information and credit decisions. Bilingual agents, particularly Spanish/English, are often needed. See more bilingual call center jobs. GE offers generous benefits to its full time employees. These include health, dental, vision, and prescription coverage; flexible spending accounts, disability insurance; retirement plan and paid time off. However, most, if not all, of the work-at-home positions are part time (less than 20 hours per week.) GE offers “limited benefits” to these employees. 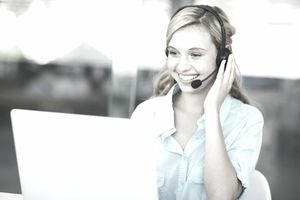 To find more call center jobs that offer benefits, see this list of employment call center jobs. When GE has work-at-home positions open for hiring, it will have them listed in its call center careers page. If no work at home jobs are listed, it is not hiring at this time. Applicants must be at least 18 or older and have at least six months customer service experience and a high school diploma. GE Call Centers that hire home-based agents are located in Arizona, Texas, and Ohio. Occasionally the company may hire work-at-home agents in Canada. (See more work-at-home jobs in Canada.) Applicants for work-at-home positions must live within 65 miles of a brick-and-mortar call center. New agents must attend full-time training for up to two weeks at the call center and onsite meetings a minimum of four times a year. Set aside at least 60 minutes to complete the online application. First you will answer some general questions, then you may or may not be selected to continue to an online assessment. Applicants, who are offered a position will have to undergo a background check, drug screen and fingerprinting before beginning work. Agents must provide their own non-wireless headset, landline phone and Internet connection. For more profiles like this, see these work-at-home call center company profiles.